What’s the correct way to clean a juicer? Even if you clean your juicer every time you use it, you may still be faced with a buildup of mineral deposits, scale, or a coating of dried juice particles. So what’s the best way to clean it? Every time you juice, the parts should be thoroughly rinsed, scrubbed with a brush, and from time to time cleaned with a bit of detergent. But even if you follow this procedure, you may see a brown or grayish coating appear on some of the parts. These are a mixture of dried juice particles and hard water deposits and definitely should be cleaned. Why? These coatings can provide a place for bacteria to grow – bacteria which can end up in your juice. These deposits can, over time, clog the fine holes in the juicing screen This not only will reduce juice yield, but if allowed to continue unchecked, can cause the screen to break under pressure. 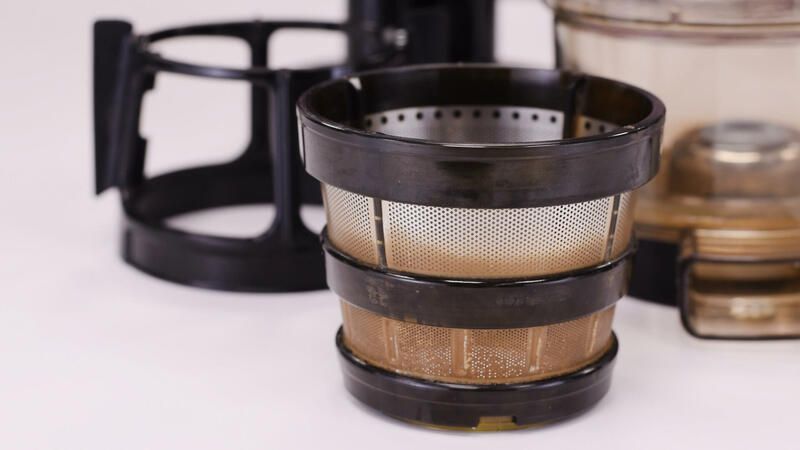 To help demonstrate how to properly clean a juicer, besides the daily regimen already mentioned, we’ve produced a video that shows three simple ways to get rid of these stubborn deposits. All three methods involve a similar procedure of soaking the juicer parts in a cleaning solution and then brushing them to remove the deposits. If your juicer parts have a coating of mineral deposits or hard water scale,use a mixture of 1 part water to one part vinegar, with the juice of one lemon added to it. Allow it to soak at least an hour, and preferable overnight. For the brown coating of dried juice particles, or mold on the silicon parts, it’s better to use a solution of 2 parts water to one part Sava Original disinfectant (bleach). If you prefer not to make your own mix, you can soak all parts in the juice cleaner Citroclean. For the best results, use warm water (to 50˚ C). For very stubborn build up, use a more concentrated mixture with less or no water.